Soon cyclists won’t have to weave between double-parked cars and speeding traffic on the heavily-traveled stretch of Fifth Avenue south of 23rd Street. Last night DOT presented a plan to flip the biking and parking lanes between 23rd Street and 8th Street to Manhattan Community Board 2 [PDF]. The Fifth Avenue bike lane dates back to 1978, with a painted buffer that DOT added nearly a decade ago. That design is not working: The corridor gets more bike traffic than any other Manhattan avenue, according to DOT, but the bike lane is almost always blocked by double-parked cars. Transportation Alternatives has been calling for a protected bike lane for several years, collecting 10,000 signatures to “flip Fifth” by the end of 2013. (It’s now up to 17,000.) DOT committed to studying a redesign a few months later, after Council Member Dan Garodnick and Community Boards 2, 4, and 5 all signed on in support. DOT’s project will cover Fifth Avenue from 23rd Street to 8th Street, leaving the avenue without a bike lane in the heart of Midtown, as well as a block-long gap north of Washington Square Park with no protection. On the narrower block between 9th Street and 8th Street, DOT wants to remove 10 parking spots from the east curb to make room for a six-foot bike lane, five foot buffer, and plastic posts. Overall, the project would remove a total of 38 on-street parking spots, 20 in CB 5 and 18 in CB 2, mostly to make room at intersections for painted pedestrian islands. DOT project manager Nick Carey said a protected bike lane on the final block of Fifth Avenue before Washington Square Park would not be possible without removing a parking or travel lane. Meanwhile, only two intersections — at 14th Street and 8th Street — will get split-phase signals, which give pedestrians and cyclists a separate crossing phase from left-turning motorists. Split-phase signals are safer than DOT’s preferred intersection treatment, “mixing zones,” which require cyclists and motorists to negotiate the same space at the same time. Overall, the 40 or so people in the room received the project positively, but there was a sense that DOT should go farther. Last December, Garodnick and five other elected officials, including Council Member Corey Johnson and Manhattan Borough President Gale Brewer, sent DOT a letter calling for protected bike lanes and bus lanes on the entire lengths of Fifth Avenue and Sixth Avenue. This project delivers on part of that goal but leaves a lot unfinished. 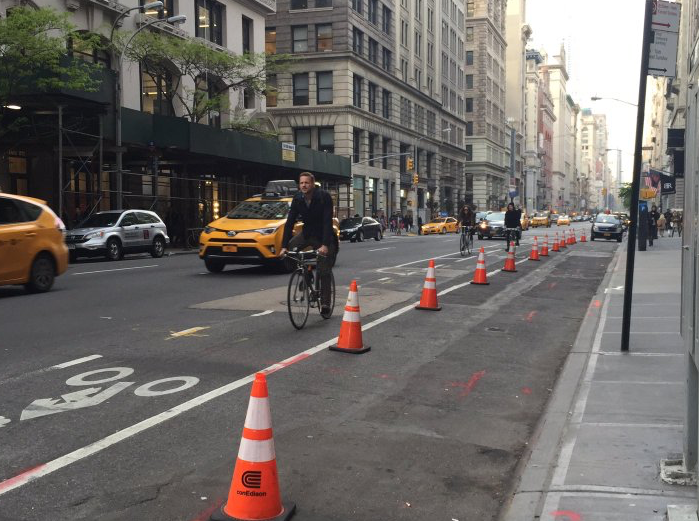 Likewise, there’s no plan at the moment to extend the Sixth Avenue bike lane north of 33rd Street. “The problem for pedestrian, motorists, and cyclists is we have this patchwork now,” Maury Schott, a former board member, told Carey. Attendees last night said the block near the park should get protection too. Nearly every hand went up when committee chair Shirley Secunda who would be fine with losing the parking lane on that last block. The committee endorsed the project, with additional requests that it be extended all the way to Washington Square, that the painted pedestrian islands be cast in concrete, that loading and unloading zones be considered to prevent double parking. DOT will present the proposal to CB 5 later this month. The full board of CB 2 will vote on the plan on March 23 at 6:30 p.m. in the Scholastic Building, located at 557 Broadway. well done community – a small but vital step. now to get a 5th ave. PBL all the way to Central Park. more than 12% of roadway traffic on 5th are cyclists. Perhaps they deserve 15% of roadway width. This is awesome. Trottenberg’s DOT is WAY behind the CBs and Councilmembers on this. Oh, but the threat of bicycle terrorists is real! How about flex posts between E 23rd St and Broadway? And how about a sidewalk expansion north of Broadway to Central Park on 5th Ave? I’m guessing the justification for starting at 23rd is that it’s an extension of the lane on Broadway (which has gaps and unprotected blocks). Your mileage may vary on the usefulness of this routing, particularly since there is such a huge gap in protected north-south routes in East Midtown. That last block is a sad omission. It’s 2017. STOP LEAVING GAPS. I don’t understand the justification for flex posts. Why not use metal? City would be more likely to use flex posts for emergency vehicle access. A daylit intersection on the NE corner and a split phase light would be the way to handle Waverly and 5th. The Fifth Avenue protected bike lane got a thumbs up from the Manhattan Community Board 5 transportation committee last night. The committee voted in favor of the project last night, according to Transportation Alternatives Manhattan Organizer Chelsea Yamada.